This ongoing section features the strategies of small and rural departments that have used free and low-cost social media resources to help their communities and increase the impact of First Responders in coordination and communication. We encourage readers not just to look at these opportunities for their own departments, but to connect with the agencies you see featured here to promote outreach to your own community. In an emergency, not every citizen may hear the tornado sirens, and if the TV is off, may not see the warnings across their program screens. Enter the world of social media: Facebook, twitter, and in this case, a new app. 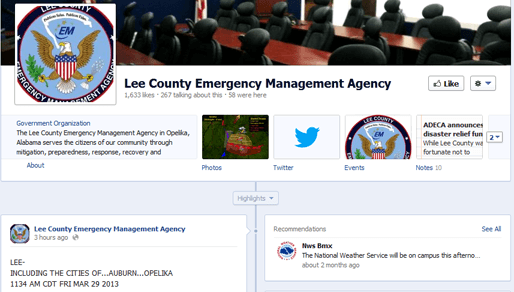 Computers and smartphones have reached almost every household, and Lee County, Alabama, Emergency Management Agency is taking advantage of the most popular social media platforms to reach their community. “This is a great way for a department with limited or no budget to get critical information out,” says Chris Tate of the Lee County EMA. Lee County updates their Facebook page daily. Chris adds, “You want to make sure you stay active, current, and relevant with your information, or you will not keep getting attention.” In addition to Facebook, Lee County is connected on Twitter and Google Plus, providing the county’s 143,000 permanent residents and growing college population with the up-to-date information that matters most in the event of a disaster. If your department would like to increase its social outreach, Lee County would like to help! Chris has graciously offered to share his experience with Emergency Management and first responder departments that would like assistance in social networking. Call 334-749-8161, or connect through Facebook, Twitter, or any of the other media outlets you see here. Six months ago, Lee County launched a free app, developed by the OCV company, to deliver news and emergency information to iPhone and Android users. 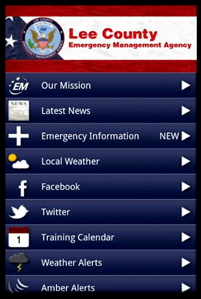 The app interface includes easy access to all Lee County EMA social media pages, as well as emergency information, local conditions, and the EMA training calendar available in their area. Chris noted that they are currently working on the technology to send “push” notifications in the future. Try out the free Lee County EMA app and find new ways your department may benefit from new social media opportunities. Along with offering outreach through social media, Lee County EMA hosts an extensive range of Community Emergency Response Team (CERT) programs to train citizens on steps to take in case of a disaster. CERT is a part of the Citizens Corps Program, sponsored by the Alabama DHS, Alabama EMA, and the Governor’s Office of Faith-Based and Community Initiatives, and designed make a community “safer, stronger, and more aware” in the event of an emergency. The eight section course has been adapted to meet the needs of Lee County, and helps members of the community “save and sustain lives” while first responders are en route to their location. In addition to posting on the main EMA website, Lee County makes class information, times, and announcements available on their social media pages, connecting safety and accessibility for the community they serve.